So, our first game is only a couple weeks away. We’re starting the season with an away game for the first time in…oh I don’t know…decades. We’re welcoming Pittsburgh to the ACC apparently. And in order to welcome them, we have to go to Pennsylvania. I think it’d be more appropriate to hang garnet and gold bunting in the visitor’s locker room at Doak Campbell and maybe have the FSU team sign their names on a friendly “Welcome” banner or something, alas I do not make the rules. I remember my first year or two at FSU, I always wore shirts from the campus bookstore. It’s like I needed to have “FSU Seminoles” and a Native American spear plastered on my t-shirt or else run the risk of being mistaken for a fan of the opposing team. Towards the end of my tenure in Tallahassee I began to just wear the right colors. Shades of red, yellow, or black. Slap on an FSU button or an accent scarf and I was good to go. 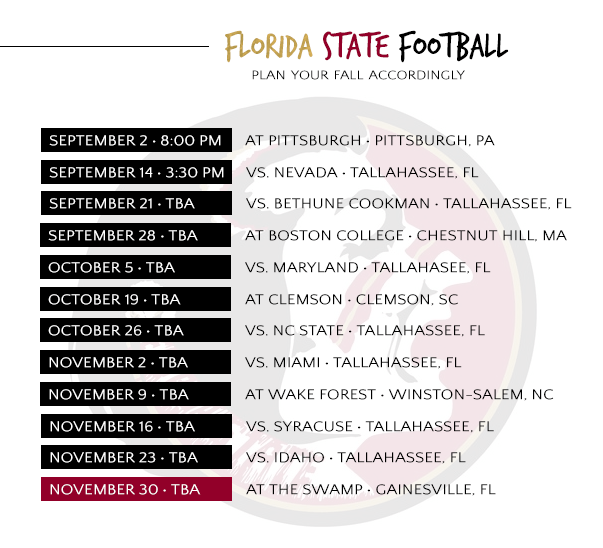 And if you’re interested in FSU’s 2013 Football Schedule – here you go. I loooove the arrow necklace. I saw a few when I was up in Tallahassee last weekend. I'm kicking myself now for not buying it. So excited for football! Cute stuff! Where can I find the mustard tunic (#4)?And yes, we definitely gave Pitt a welcoming party not to be forgotten. Go Noles!